Balance hormones, nourish qi, boost spleen function, clear hormonal acne (use with skin Skin Clear), smooth liver qi stagnation, move & nourish the blood thus relieving menstrual symptoms long term. Women's Harmony - The Hormone Balancing Formula For All Menstrual Conditions! We want you to understand that long term healing is possible. You can have a 1/10 pain almost invisible menstrual period with no need for ibuprofen. Try Women's Harmony for 2-3 months and find your healthy, pain-free, on time menstrual cycle. In Chinese medicine herbs like Dang Gui and Xiang Fu in this formula are used to treat “The Root” of Menstrual issues by balancing hormones, smoothing liver qi stagnation, tonifying the blood and boosting spleen function. The compounds in the herb dang gui in this formula, called phytoestrogens, create balanced levels of estrogen in women's bodies and help to create hormonal balance in a women's body. Amenorrhea, Cramps, Menstrual related Hormonal Acne, Abdominal Pain, Breast Tenderness & Irritability are “The Branch”, or Symptoms of a deeper issue. The “Root” issue is Liver Qi Stagnation preventing the spleen from turning food into Essence, leading to a deficiency of blood and qi (energy). These deficiencies affect mood and create stagnation in the meridians (energetic pathways) causing pain. We recommend using "Women's Harmony" twenty-five days of the month to balance hormones. Then, during the 4-6 days of PMS & menstruation, stop using "Women's Harmony" and start "Women's Relief" to address symptoms of pain directly and forcefully. Restart "Women's Harmony" when menstruation flow ends. It is on the BEST natural remedies for PMS. 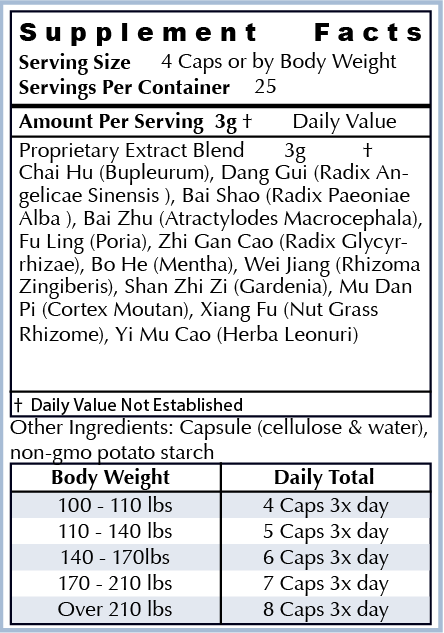 Dosage based on body weight. For best results, take for 2-3 months to fully balance hormones. Zhi Gan Cao (Radix Glycyrrhizae Preparata) is the honey-fried version of Gan Cao. Stronger than the unprocessed herb, Zhi Gan Cao is even more effective in strengthening the Qi. This sweet plant balances the Yin elements in the body and invigorates the Spleen and Stomach, improving the transformation and transportation functions of these channels. As a result, Zhi Gan Cao can treat disorders such as fatigues, shortness of breath or loose stools. Acting on the Spleen channel, Zhi Gan Cao can also be used to treat cramps and pain, especially in the abdominal tissues. Cramps are a result of Spleen deficiency and Liver excess and this sweet, neutral herb is known to harmonize these elements. Sheng Jiang (Rhizoma Zingiveris Recens), also known as fresh ginger root, has been used in Asian cooking recipes since ancient times. Valued for its health properties, Shen Jiang is also used in Chinese medicine to treat and prevent colds, enteritis and stomach problems. Slightly warm, Shen Jiang can induce perspiration and is commonly used to treat the early stages of wind-cold syndrome. This acrid herb can warm the Lung, dispelling cold and stopping coughing. From a traditional Chinese medicine perspective, blood stagnation dries the body, leading to abdominal masses such as tumors or fibroids. Mu Dan Pi (Cortex Moutan) is a natural herb used to treat some of the most common stress symptoms, such as irritability and frustration. This cool and bitter herb invigorates and moves the blood, nourishing and cooling your Yin energies. Mu Dan Pi can also treat menstrual disorders, such as early menstruation or epistaxis during menstruation. According to traditional Chinese medicine, Liver Qi stagnation is the root of menstrual issues. Sweet and slightly warm, Xiang Fu (Rhizoma Cyperi Rotundi) is considered one of the most important herbs for treatment of gynecological disorders. Harmonizing in nature, this herb soothes the liver and regulates the Qi, helping patients fight cramps, abdominal fullness and irregular menstruations. Xiang Fu is also used to regulate the Qi in the blood level and to help generate blood. Due to its unique traits, it is a common remedy for menstrual disorders and pre-menstrual syndrome. Zhong Yao Cai. 2011 Aug;34(8):1225-9.